Judith and David Tebbutt were on holiday in Kenya when they were attacked by a group of armed men. David was murdered and Judith was taken to Somalia where she was held hostage for six months. Just over a year after being freed, she describes her extraordinary determination to survive. You meet Judith Tebbutt - she likes to be called Jude - and you wonder how, after six months in a filthy, cramped room, on starvation rations of potato and rice, insulted, humiliated and occasionally threatened with summary execution, she could appear so untouched and so resilient. She was determined to survive, and that's her motivation for writing a book about her experience, A Long Walk Home, and for speaking to the BBC in one of her only interviews about the ordeal. Jude, from Bishop's Stortford, Hertfordshire, wants to be an encouragement and example to others held for ransom. "That is the message," she says. "This is for any hostages, throughout the world, especially in Somalia, because I know the conditions they're going through, not to give up hope. Hope is my saviour." Jude's nightmare began during what, at first, was a dream holiday with her husband of more than 30 years, David, who was finance director at the publisher Faber and Faber. They had met in Africa, and David loved it there. In September 2011, after a week spent on safari in Kenya's Masai Mara game reserve, they arrived at the Kiwayu Beach Resort - on an island in Kenya's Lamu archipelago, but only 40 km (25 miles) from the coast of Somalia. Jude was uncomfortable from the start. "It felt wrong," she says. "It was completely quiet. When I was told there was nobody there except us, that felt really strange. "The room we were in was so far away from the rest of the building. But David said 'Don't worry, this will be our Robinson Crusoe experience.'" But on that first night, she was awoken by the sounds of David struggling with someone in the dark. Then she was jabbed with the barrel of a rifle and dragged down to the beach. Barefoot and in her pyjamas, she was manhandled into a boat, thrown on top of fuel cans, and the boat sped out to sea. "I hit my head, which cut my eyebrow. My mind was racing... trying to make sense of this terrifying experience," she says. It's clear, though, that even from those first shocking moments, Jude, was calculating how she could get some control over the situation. She would smile at her captors, for example - as a way of building a basic level of rapport. Jude, who had worked as a mental health social worker, believed she needed to engage with the pirates as much as possible. As her captivity extended into weeks, she taught herself some Somali so she could say "please" and "thank you" and make them see her as a human being - not just a commodity to be sold. "Even though I despised these people, I knew that if I was going to be in their company for any length of time, I needed to try and build a rapport with them, build a connection." There were other small victories, like refusing to wear full Somali dress. 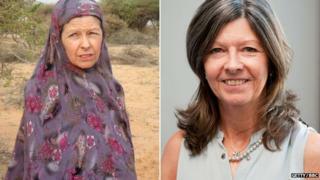 "I'm not a Somali woman, and I didn't want to be a Somali woman - so I took it off straight away. I felt suffocated covered in all these robes, and completely alien. "That's really important, not to lose your own identity. However cruel they are to you, however they degrade you, you must remind yourself of who you are, all the time. I was still Jude, and I wanted to come out as Jude. I wanted to find a life for Jude again." And there was the walking. Confined in a hot, dirty room, Jude was determined to keep herself as fit as possible. So she devised a timetable of exercises - walking half-an-hour in each daylight hour. She did pilates too - much to the confusion of her captors. She kept up her exercise schedule while she was strong enough - but the poor diet made her too weak by the end of her imprisonment. Negotiations for her release began within a few days of her arrival in the village where she was to be kept. A few weeks in, her son Ollie was able to reach her on the pirate negotiator's phone. "I said to Ollie 'How's Dad? How's Dad taking this?'" Jude had convinced herself that David had survived and he was out there working for her release. The crews of two boats, more than 40 people in total, are being held hostage by Somali pirates. The fishing vessel, the Naham 3, was seized in March last year with 29 people on board. The 15-man crew of the container ship, the Albedo, have been held hostage on board their vessel since November 2010. This month, the Albedo sank. Four of the crew are missing, according to the Secretariat for Regional Maritime Security which is campaigning for their release. "One by one, they just filtered out. I was left with the leader man, and I said 'It was you. You killed my husband!' and it was like this face off. I thought 'I'm just going to look at you until you turn your face away.' I just felt such hatred." Throughout her captivity, she tried to gather evidence about her captors - making detailed descriptions of them and trying to gather their DNA when they touched her torch, or her notebook - hoping that one day they would be caught and be held accountable. But she says she does not want her kidnappers dead. And she doesn't want to be consumed by the desire for revenge. "I don't want them to have that power over me. They are only in my head when I want them to be." After a few weeks, the pirates allowed Jude a radio, and she listened to the BBC World Service - including some programmes broadcast from Somaliland. "I was sitting in a very dark room listening to you. You have no idea what that means to me, you really don't! "You interviewed one young woman whose family had gone back to Somaliland from Hertfordshire [in the UK], who was interested and dedicated to making Somaliland better. That needs to happen to the whole of Somalia." And Jude has a message to others held hostage in Somalia and around the world. "I just really want to tell people 'Do not give up hope, you haven't been forgotten'. "You may think that you're languishing but there'll be someone somewhere trying to work towards your release." Hear Judith Tebbutt's full story in Six Months in Captivity on BBC World Service at 18:00 GMT on Saturday and 12:00 GMT on Sunday.